Splash is an Event solutions company based in New York and Philadelphia. I interviewed with them at the beging on March 2019. They requested that I do a design challenge for them. 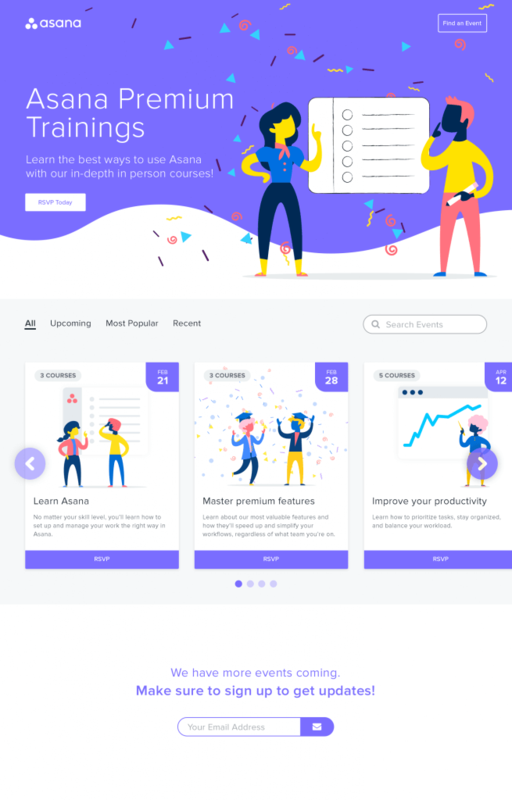 The design task was based on Asana and their online learning material. I was to design a solution for these online classes to be physical sessions someone could attend. The goal was to drive signups and stay on brand. I came up with two iterations, on has a time line that can be sorted via an ajax request and the other has a custom event slider. Both have the idea of being searchable so the user would be able to look for just about anything that would peak their interest. Signups happen by clicking the RSPV button causing a modal to appear and then the user can choose their desired course from the learning material.